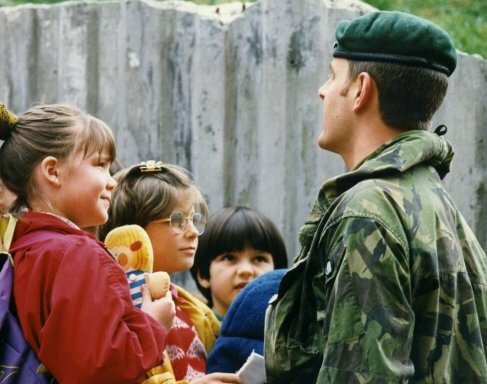 « Victims of genocide in Srebrenica evacuated from war-torn Bosnia… A proud day for Leeds born soldier. Humanitarian aid delivered to the 540 children of Os Nafija Saraljic school Sarajevo and Vrtic Vrapcic Kindergarten. Sejla Sofovic looks at Vic with an endearing beauty. This entry was posted on March 26, 1996 at 10:38 am and is filed under Uncategorized . You can follow any responses to this entry through the RSS 2.0 feed Responses are currently closed, but you can trackback from your own site.